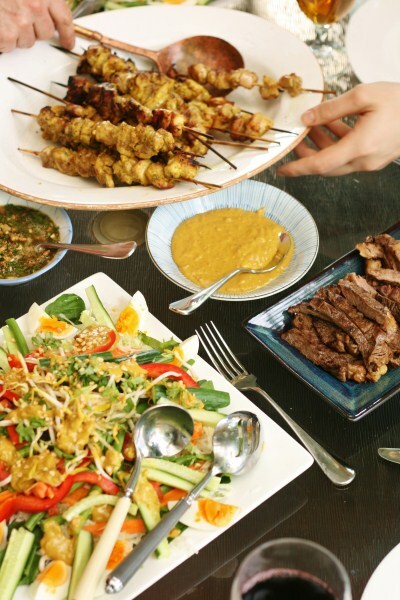 Gado Gado served with chicken skewers and some finely sliced fillet steak. Gado Gado is a well know dish from Indonesia and means “mix mix”. 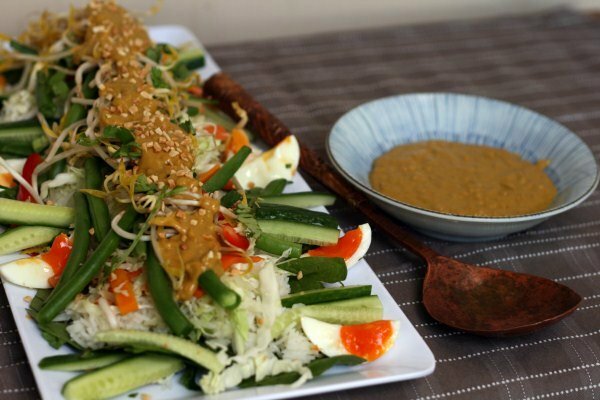 It’s a salad which combines raw and blanched vegetables with eggs and is served with a delicious peanut satay sauce. This is an adaption of a recipe from Chris, a Thermomix Group Leader in the Melbourne Bayside area.. Her parents lived in Indonesia and it’s her mother’s recipe….the Thermomix version. Chris’s original is on the Thermomix recipe community. I have adapted it for a larger crowd, but for a mid-week dinner, Chris’s is a great all in one Varoma recipe. I love to serve this dish for a crowd. I have three siblings and this dish feeds all of them and their families. So it’s a great one if you are feeding the masses. It’s easy, delicious, and it looks beautiful (which is always high on my list of priorities). My alterations from Chris’ original recipe are to use basmati rice and cook the chicken separately, I usually send out some skewers to be barbecued and I sometimes cook the eggs (about six) ahead of time so that I can fit more rice in the basket, but that is only if I am feeding more than 12. Prepare beans, carrots and cabbage in Varoma dish. Place rice in rice basket with eggs on top. I often do this before guests arrive and place Varoma dish in the fridge. Assemble baskets in and on bowl and cook for 14 minutes on speed 4Varoma temp. Once cooked remove rice and place on a large platter. Place the uncooked spinach leaves on top off rice then add the vegetables and boiled eggs (peeled and quartered) on top. Drizzle peanut sauce over and garnish with bean shoots and chopped peanuts and coriander. Place coriander and cumin in TM and mill on Speed 8, 2 minutes. Take out and set aside. Place garlic, onion, tumeric and chili into TM bowl and chop for 8 seconds, Speed 7. Add all other ingredients including the spices and cook on 100′, 5-8 Mins, Speed 3. I had a cooking class in Mt Waverley on Monday night and someone mentioned your blog as being a very good resource. So evidently YOU'RE famous too. This is such a beautiful recipe, everyone loved it. Thanks for sharing.